Make no mistake, Molly is a swagman. It is a title that carries its own raffish assertion of independence, there are no swagwomen, only swagmen and Molly is a proud swagman. She told me it all began with her great-grandfather who was a swagman on Petticoat Lane and he lived to be ninety-nine. And now I shall expect no less from Molly herself – because there is no doubt that, as a fourth generation swagman, she is the shrewd inheritor of the good humoured perseverance which is required to achieve longevity in market life. Although I always knew the word “swag” from comic books where masked burglars have it written on their sacks, it was Molly herself who first explained to me that, “Swag is when you are selling a variety of goods, from clothes to jewellery – anything you can find.” And she gave me a significant glance of complicity, which led me to assume there might be a shady history, before returning to her plate of bacon and egg accompanied by a pile of toast, that formed the primary focus of her attention at that moment. 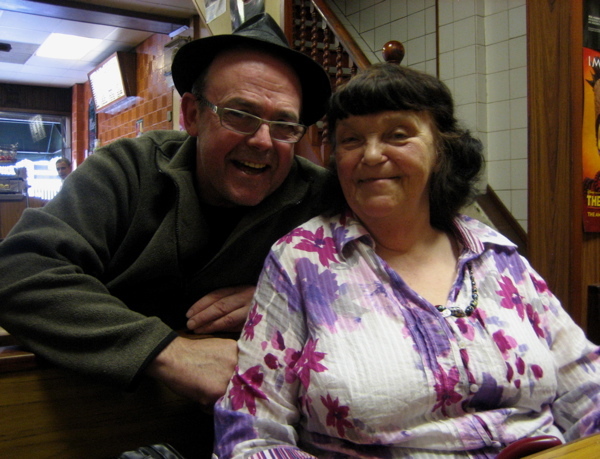 We were enjoying a hearty breakfast in Dino’s Cafe in Commercial St, huddled together round a small table at the back with Molly’s old friend Jimmy Cuba and Ellen, her loyal associate from the market, completing the party. Molly’s pedigree as a swagman imparts a certain singularity of attitude which baulks no condescension, and graces her with a sharp line in back chat to accompany it. “If they say, ‘You’ve got to give me a discount.’” recounted Molly, raising her eyebrows in delight and assuming a hoity-toity voice, “I say ‘Why? Do I know you?” Then she chuckled to herself, recalling another recurring dialogue. “Those yuppies, they ask ‘If I buy this, can I get this free?’ So then I put on my best Cockney voice…” she continued, placing a hand on my forearm and assuming an archly demure manner, “and I say, ‘Here love, come back next week, when you’ve got a bit more money.’” Chuckling, again and launching into a raucous self parody, “They’ve got to be hedge-ucated!” she declared with a triumphant grimace, pressing the ball of her hand on the table in response to the general mirth of those of us who comprised her audience. I learned that Molly’s experience is not restricted to market life, because for five years, she worked as girl-Friday to Peter Grant, the manager of Led Zeppelin and, as we sipped tea and digested our breakfasts, she regaled Jimmy, Ellen and me with her tales of the rock and roll years. “The boys used to call me ‘ma’.” she revealed shyly, “I knew them all, Mickie Most, Adam Faith and the rest. They all came down to the country where I used to cook breakfast for the guests, walk them round the house and make up these fantastic ghost stories. When I was down there, I treated them just like anybody else. One day this tall blond guy came down with his laundry, so I showed him how to work the machine – that was Robert Plant.” At this point, Jimmy Cuba contained himself no longer, interposing, “This was when Led Zeppelin were the biggest band on the planet!” and Molly smiled bashfully, blushing a little to recall her days as a rock chick now. 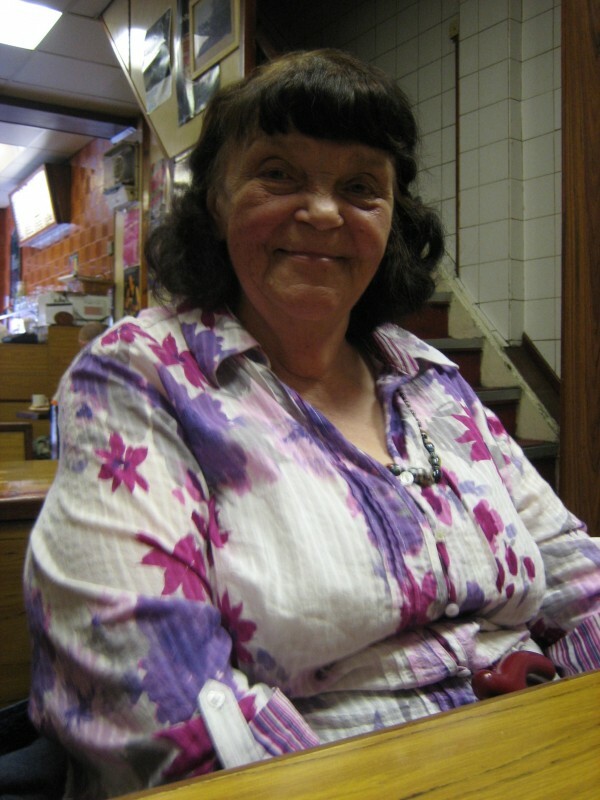 Each Wednesday, Thursday and Friday, you will see Molly stalling out in the Spitalfields Market with Ellen at her side, the lone swagman with her modest swag spread out before her on the table. Even after all these years Molly cannot predict each day’s trading, market life is akin to gambling in that way. The two self-effacing women preside like sentinels, whispering together about the ceaseless spectacle passing before them. For Molly, it is a fleeting show, because she is the living representative of the three that came before her and it gives her a unique sense of perspective. Market life has made her circumspect and she would not tell me her full name or even reveal the name of her great-grandfather who lived to be ninety-nine. Yet I was honoured to speak with her because Molly is an extraordinary woman, dignified, witty and with great strength of character, and she is the last of the Spitalfields swagmen. 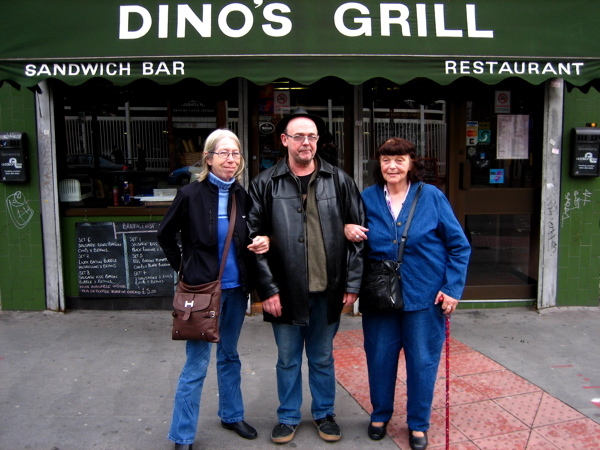 Ellen, Jimmy & Molly outside Dino’s in Commercial St.
give their lives to this market including myself and my husband. your determination to bring us the spirit of Spitalfields. Big up Molly and Ellen and even Jimmy. As you wistfully record the too rapidly changing face of Spitalfields, I search for something, anything as interesting, authentic or culturally dynamic as that which went before.